Experiential marketing is most often used by brands to provide customers with an enjoyable experience in a bid to build love and loyalty. However, there’s also nothing quite like experiential when it comes to grabbing the attention of passers-by with a hard-hitting, and sometimes hard-to-stomach, message. 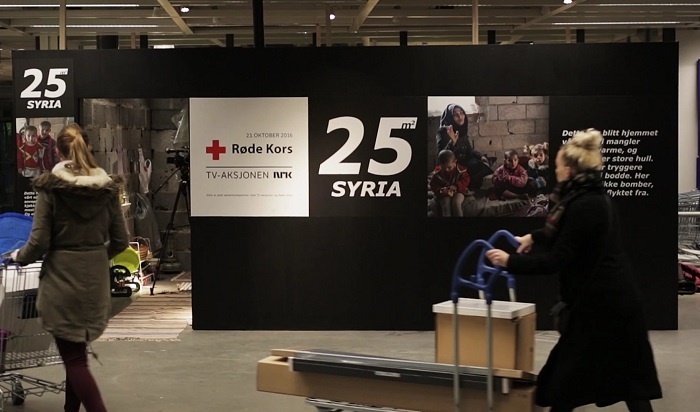 When furniture and home furnishings store IKEA wanted to promote the work that The Red Cross is doing to aid families in Syria, it created a campaign stunt that was impossible for shoppers to ignore. Many are familiar with IKEA having sleek and modern showrooms within its stores, but one room within its flagship premises in Slependen, Norway, was recently transformed into a replica of a Syrian home in the midst of crisis. The 25-square metre home was made up of cinder block walls, scant furnishings, and had a noticeable lack of appliances, bringing home the extent of the conditions that many people in Syria are currently living in. IKEA price tags and posters were placed around the room, including information to help highlight the lack of food, medicine and clean water the country faces. The tags also cleverly doubled up as donation slips for the charity. This isn’t the first campaign that has transformed a room to highlight living conditions around the world – charity Techno transformed a New York apartment into a slum to shock those on a quest for a new home. Both are great examples of putting consumers right in the centre of a campaign in order to make sure that an important story gets told.